Domaine Tempier | Cooking Wine And Travel - The site where Foodies Unite! On one of our trips to the Mediterranean coast we visited the tiny seaside village of Cassis, France. Our friend Peter Freeman (and one of the wine distributers for our restaurants), suggested we visit a vineyard that he represents called Domaine Tempier. Peter told me that Domaine Tempier was developed by the Peyraud family and had become famous for its Rose wines. The Peyraud family have resided just outside of Cassis in Le Plan de Castellet since at least the end of the 18th Century. Their house was built in 1834 and still is used to greet guests and perform their wine tastings. It was not until 1940 that Domaine Tempier was created with the marriage of Lucie (“Lulu”) Tempier and Lucien Peyraud. Lucien Peyraud was instrumental not only for creating Domaine Tempier, but he is considered responsible for the revival of Mourvèdre and the creation of the Bandol appellation. Up until that point, old vineyards planted with Mourvèdre had been systematically replanted to higher-yielding varietals. However, his research showed the grape proved to be more resistant to oxidation and capable of producing wines with great aging potential. Lucien worked with the I.N.A.O. (Institut National des Appellations d’Origines) to establish Bandol as its own A.O.C. and large-scale replanting of Mourvèdre followed. Bandol now requires a fifty percent minimum of Mourvèdre in all reds, and Lucien will forever be celebrated as the Godfather of Bandol. During his time at Domaine Tempier, until his death in 1998, Lucien Peyraud oversaw more than fifty vintages, and shaped the estate into what it is today. Lulu and Lucien raised seven children, and when Lucien retired, sons François and Jean-Marie shared management of the domaine. Lucien passed away in 1996, and his sons have now since retired. The family engaged the talented Daniel Ravier as winemaker to carry on the great tradition and style of the domaine. When we first arrived at the front door of Domaine Tempier, we were greated by Lulu’s daughter, Laurence Peyraud. Laurence was a gracious host and explained the history of the domaine and gave us a tour of the vineyards. Lucien Peyraud purchased La Tourtine, the distant hillside vineyard visible in the image above, in 1951, and then the Migoua vineyard in 1952. Both were rich in Mourvèdre, and allowed the domaine to gradually increase the proportion of Mourvèdre in their wines. These sites eventually became the sources for Domaine Tempier´s special cuvees, including Cuvée Spéciale (first introduced in 1968), and in 1969 Domaine Tempier began to release single vineyard bottlings from the Migoua and La Tourtine vineyards. The Migoua vineyard is a 6.5 hectare site in Le Beausset-Vieux and is the only one of the Tempier sites not visible from the Peyraud home. This vineyard is planted mainly with Mourvèdre, and gives rise to two cuvées, La Tourtine and Cabassaou. We happened to visiting the vineyard right in the middle of harvest, so we were quite surprised (and very excited) when Laurence offered to take us through the fermentation rooms and the barrel cellar. The harvest is 100% manual and the fruit is fully destemmed before temperature-controlled fermentation. The rosé is fermented in steel after a cold soak, then matured in vat for 6-8 months before bottling. The reds are fermented in steel or concrete. After blending, the wines spend 18-20 months in large oak casks of varying size, with some oak sourced from as far away as Austria. The end results, bottled without filtration or fining, produces highly regarded wines worthy of bottle age. 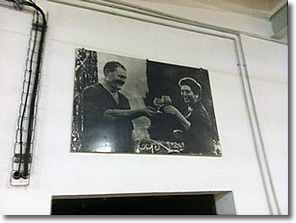 One of the hallmarks of the barrel cellar is a 1930’s era photo of Laurence’s parents, Lucian and Lulu Peyraud. The picture shows a smiling Lucian, who had just crawled out a fermentation barrel that he was cleaning and completely drenched with grape residue. Lucian is a stark contrast to the elegantly dressed Lulu who is pictured greeting him with glasses of fine cognac. This picture exudes the love and passion that Lucian and Lulu had for each other and the wonderful wines they produced. Laurence then escorted us to back to the main house where we tasted their wines. Although very well known for their special cuvees, for the overall value, I was most impressed with their basic red wine, the Bandol cuvée, which is still a wine of quality despite the fact that it is produced from vineyards where the best fruit has already been extracted for the higher quality vintages. Domaine Tempier is probably most famous for their rosé, which accounts for approximately one third of the output and is considered one of the world´s most appreciated rosés (once proclaimed by Robert Parker as the greatest rosé in the world). We did not have much prior experience with Rose’s, but crispness of this wine coupled with an extremely well balance of fruit and acidity made us a permanent admirer. Before we left, I presented Laurence with a copy of my cookbook as a token of our appreciation for giving us such a wonderful day. 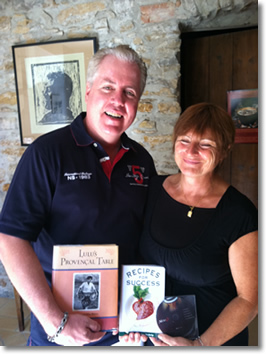 Upon receiving our gift, Laurence explained that her mother, Lulu, was famous for her Provençal cuisine and had written a well known cookbook. Her traditional hearth cooking has attracted attention throughout France, even bringing Alice Waters over from California to learn in Lulu’s kitchen. Laurence showed us her personal copy of her mother’s cookbook (which I later purchased a copy of on Amazon.com). There has always been a special link between great food and great wine, and the Peyraud Family of Domaine Tempier exemplify how the worlds of cooking and wine exist in perfect harmony. If you ever make it to this part of the world, you should take the opportunity to visit the Bandol wine region, and especially Domaine Tempier. You will learn that the French world of wine is much bigger than Bordeaux, Champagne and Burgundy, and the Grand Cru’s of Bandol are among the elite class of French wines.